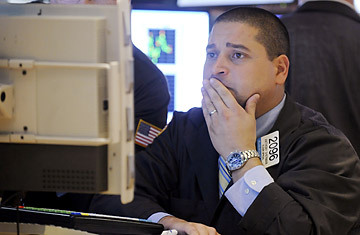 A trader with the look of despair over the economy sent Wall Street plunging again Wednesday, propelling the Dow Jones industrials down 733 points to their second-largest point loss ever. Three weeks after the stock market crash in 1929, Lawrence J. Fava jumped into the Schuylkill River in Philadelphia. He was a middle-aged real estate dealer, and he was "frantic" about the losses he had suffered, according to his suicide note. He left the note on the Girard Avenue Bridge and then leapt into the dark, frigid water, according to a small item published that month in the New York Times. But Fava survived the fall, and he regretted his decision at once. Fava thought the Schuylkill River held a solution. Not a solution to his financial woes, alas, but to the anxiety that had hijacked his peace of mind. He was stalked by a fear of the future  "of the innocent persons who would suffer" because of his losses. But when he hit the river, he was suddenly afraid of something clear and present. Fava had perspective, and he clung to a piling in a desperate bid to undo his decision. In the face of the current economic meltdown, some people have more reason than others to worry  people, for example, who need to spend their savings very soon. For them, fear serves a purpose: it encourages action, which may prevent further losses. But for most of us, what will happen in the stock market in three or 10 or 20 years, when we will most need our savings, is unknowable. We can't predict the financial future, so we shouldn't try. But anxiety doesn't work according to those rules. The part of the brain that takes over when we are frightened is called the amygdala. It's an ancient, almond-shaped mass of nuclei located deep within the brain's temporal lobes. The amygdala is designed to be wildly sensitive to certain things  for instance, anything uncontrollable and unfair (like a terrorist attack involving an airplane)  and remarkably forgiving toward other, far deadlier menaces that seem to be small in scale (car crashes) or involve less suffering (heart attacks). Most of all, the amygdala loathes unpredictability of the kind we are currently enduring. Lab experiments with rats and humans show that both species prefer predictable electric shocks over unpredictable shocks. That's because, on a normal day, the brain works by following shortcuts. We recognize patterns in order to make split-second judgments about what we are seeing. Shortcuts are ruthlessly efficient, which is important for an organ that only uses about 40 watts of power per operation. But the more uncertainty we face, the more shortcuts our brains use. And the shortcuts lead to a slew of predictable errors.